This form is a real estate purchase contract for the all cash acquisition of a a full service hotel that is flagged with a national hospitality franchise. The agreement features an extensive list of defined terms, and provides for a 45 day review period during which the buyer conducts its due diligence for the purchase. This PURCHASE CONTRACT (this “Contract”) is made and entered into as of ______, 20__, by and between HOTEL OWNER, L.L.C., a ________ limited liability company (“Seller”) with a principal office at _________________ and HOSPITALITY PURCHASER , INC., a ________ corporation, with its principal office at _______________, or its affiliates or assigns (“Buyer”). A. Seller is the fee simple owner of that certain ____ room hotel property commonly known as the _____________, located at ______________(the “Hotel”) identified in on Exhibit A attached hereto and incorporated by reference. B. Buyer is desirous of purchasing the Hotel from Seller, and Seller is desirous of selling the Hotel to Buyer, for the purchase price and upon terms and conditions hereinafter set forth. “Additional Deposit” shall mean $150,000. “Affiliate” shall mean, with respect to Seller or Buyer, any other person or entity directly or indirectly controlling (including but not limited to all directors and officers), controlled by or under direct or indirect common control with Seller or Buyer, as applicable. For purposes of the foregoing, a person or entity shall be deemed to control another person or entity if it possesses, directly or indirectly, the power to direct or cause direction of the management and policies of such other person or entity, whether through the ownership of voting securities, by contract or otherwise. “Appurtenances” shall mean all rights, titles, and interests of a Seller appurtenant to the Land and Improvements, including, but not limited to, (i) all easements, rights of way, rights of ingress and egress, tenements, hereditaments, privileges, and appurtenances in any way belonging to the Land or Improvements, (ii) any land lying in the bed of any alley, highway, street, road or avenue, open or proposed, in front of or abutting or adjoining the Land, (iii) any strips or gores of real estate adjacent to the Land, and (iv) the use of all alleys, easements and rights-of-way, if any, abutting, adjacent, contiguous to or adjoining the Land. “Brand” shall mean _____________, the hotel brand or franchise under which the Hotel operates. “Business Day” shall mean any day other than a Saturday, Sunday or legal holiday in the State of ________. “Closing” shall mean the closing of the purchase and sale of the Property pursuant to this Contract. “Closing Date” shall have the meaning set forth in Section 10.1. “Contracts, Plans and Specs” shall mean all construction and other contracts, plans, drawings, specifications, surveys, soil reports, engineering reports, inspection reports, and other technical descriptions and reports. “Deed” shall have the meaning set forth in Section 10.2(a). “Deposits” shall mean, to the extent assignable, all prepaid rents and deposits (including, without limitation, any reserves for replacement of FF&E and for capital repairs and/or improvements), refundable security deposits and rental deposits, and all other deposits for advance reservations, banquets or future services, made in connection with the use or occupancy of the Improvements; provided, however, that to the extent Seller has not received or does not hold all of the prepaid rents and/or deposits attributable to the Leases related to the Property, Buyer shall be entitled to a credit against the cash portion of the Purchase Price allocable to the Property in an amount equal to the amount of the prepaid rents and/or deposits attributable to the Leases transferred at the Closing of such Property, and provided further, that “Deposits” shall exclude (i) reserves for real property taxes and insurance, in each case, to the extent pro rated on the settlement statement such that Buyer receives a credit for (a) taxes and premiums in respect of any period prior to Closing and (b) the amount of deductibles and other self-insurance and all other potential liabilities and claims in respect of any period prior to Closing, and (ii) utility deposits. “Due Diligence Examination” shall have the meaning set forth in Section 3.2. “Earnest Money Deposit” shall have the meaning set forth in Section 2.6(a). “Escrow Agent” shall have the meaning set forth in Section 2.6(a). “Escrow Agreement” shall have the meaning set forth in Section 2.6(b). “Exception Documents” shall have the meaning set forth in Section 4.2. “Existing Franchise Agreement” shall mean that certain franchise license agreement between the Seller and the Franchisor, granting to Seller a franchise to operate the Hotel under the Brand. “Existing Management Agreement” shall mean that certain management agreement between the Seller and the Existing Manager for the operation and management of the Hotel. “Existing Manager” shall mean _________. 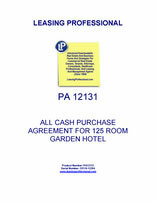 “FF&E” shall mean all tangible personal property and fixtures of any kind (other than personal property (i) owned by guests of the Hotel or (ii) leased by Seller pursuant to an FF&E Lease) attached to, or located upon and used in connection with the ownership, maintenance, use or operation of the Land or Improvements as of the date hereof (or acquired by Seller and so employed prior to Closing), including, but not limited to, all furniture, fixtures, equipment, signs and related personal property; all heating, lighting, plumbing, drainage, electrical, air conditioning, and other mechanical fixtures and equipment and systems; all elevators, and related motors and electrical equipment and systems; all hot water heaters, furnaces, heating controls, motors and equipment, all shelving and partitions, all ventilating equipment, and all disposal equipment; all spa, health club and fitness equipment; all equipment used in connection with the use and/or maintenance of the guestrooms, restaurants, lounges, business centers, meeting rooms, swimming pools, indoor and/or outdoor sports facilities and other common areas and recreational areas; all carpet, drapes, beds, furniture, televisions and other furnishings; all stoves, ovens, freezers, refrigerators, dishwashers, disposals, kitchen equipment and utensils, tables, chairs, plates and other dishes, glasses, silverware, serving pieces and other restaurant and bar equipment, apparatus and utensils. A current list of FF&E is attached hereto as Exhibit B. “FF&E Leases” shall mean all leases of any FF&E and other contracts permitting the use of any FF&E at the Improvements that are assumed by Buyer. “Financial Statements” shall have the meaning set forth in Section 3.1(b). “Hotel Contracts” shall have the meaning set forth in Section 10.2(d). “Improvements” shall mean all buildings, structures, fixtures, parking areas and other improvements to the Land, and all related facilities. “Indemnification Agreement” shall have the meaning set forth in Article XVII. “Indemnified Party” shall have the meaning set forth in Section 8.8(c)(i). “Indemnifying Party” shall have the meaning set forth in Section 8.8(c)(i). “Initial Deposit” shall have the meaning set forth in Section 2.6(a). “Land” shall mean, collectively, a fee simple absolute interest in the real property more fully described in Exhibit A, which is attached hereto and incorporated herein by reference, together with all rights (including without limitation all air rights and development rights), alleys, streets, strips, gores, waters, privileges, appurtenances, advantages and easements belonging thereto or in any way appertaining thereto. “Leases” shall mean all leases, franchises, licenses, occupancy agreements, “trade-out” agreements, advance bookings, convention reservations, or other agreements demising space in, providing for the use or occupancy of, or otherwise similarly affecting or relating to the use or occupancy of, the Improvements or Land, together with all amendments, modifications, renewals and extensions thereof, and all guaranties by third parties of the obligations of the tenants, licensees, franchisees, concessionaires or other entities thereunder. “Legal Action” shall have the meaning set forth in Section 8.8(c)(ii). “Licenses” shall mean all permits, licenses, franchises, utility reservations, certificates of occupancy, and other documents issued by any federal, state, or municipal authority or by any private party related to the development, construction, use, occupancy, operation or maintenance of the Hotel, including, without limitation, all licenses, approvals and rights (including any and all existing waivers of any brand standard) necessary or appropriate for the operation of the Hotel under the Brand. “Liquor Licenses” shall have the meaning set forth in Section 8.10. “Manager” shall mean the management company selected by Buyer to manage the Hotel. “New Franchise Agreement” shall mean the franchise license agreement to be entered into between Buyer and the Franchisor, granting to Buyer a franchise to operate the Hotel under the Brand on and after the Closing Date. “New Management Agreement” means the management agreement to be entered into between Buyer and the Manager for the operation and management of the Hotel on and after the Closing Date. “Other Property” shall have the meaning set forth in Section 16.14. “Pending Claims” shall have the meaning set forth in Section 7.1(e). “Permitted Exceptions” shall have the meaning set forth in Section 4.3. “Personal Property” shall mean, collectively, all of the Property other than the Real Property. “PIP” shall mean a product improvement plan for any Hotel, as required by the Existing Manager or the Franchisor, if any. “Post-Closing Agreement” shall have the meaning set forth in Section 8.9. “Property” shall mean, collectively, (i) all of the following with respect to the Hotel: the Land, Improvements, Appurtenances, FF&E, Supplies, Leases, Deposits, Records, Service Contracts, Warranties, Licenses, FF&E Leases, Contracts, Plans and Specs, Tradenames, Utility Reservations, as well as all other real, personal or intangible property of Seller related to any of the foregoing and (ii) any and all of the following that relate to or affect in any way the design, construction, ownership, use, occupancy, leasing, maintenance, service or operation of the Real Property, FF&E, Supplies, Leases, Deposits or Records: Service Contracts, Warranties, Licenses, Tradenames, Contracts, Plans and Specs and FF&E Lease. “Purchase Price” shall have the meaning set forth in Section 2.2. “Real Property” shall mean, collectively, all Land, Improvements and Appurtenances with respect to the Hotel. “Records” shall mean all books, records, promotional material, tenant data, guest history information (other than any such information owned exclusively by the Existing Manager), marketing and leasing material and forms (including but not limited to any such records, data, information, material and forms in the form of computerized files located at the Hotel), market studies prepared in connection with Seller’s current annual plan and other materials, information, data, legal or other documents or records (including, without limitation, all documentation relating to any litigation or other proceedings, all zoning and/or land use notices, relating to or affecting the Property, all business plans and projections and all studies, plans, budgets and contracts related to the development, construction and/or operation of the Hotel) owned by Seller and/or in Seller’s possession or control, or to which Seller has access or may obtain from the Existing Manager, that are used in or relating to the Property and/or the operation of the Hotel, including the Land, the Improvements or the FF&E, and proforma budgets and projections and construction budgets and contracts related to the development and construction of the Hotel and a list of the general contractors, architects and engineers providing goods and/or services in connection with the construction of the Hotel, all construction warranties and guaranties in effect at Closing and copies of the final plans and specifications for the Hotel. “Release” shall have the meaning set forth in Section 7.1(f). “Review Period” shall have the meaning set forth in Section 3.1. “SEC” shall have the meaning set forth in Section 8.6. “Seller Liens” shall have the meaning set forth in Section 4.3. “Seller Parties” shall have the meaning set forth in Section 7.1(e). “Service Contracts” shall mean contracts or agreements, such as maintenance, supply, service or utility contracts. “Supplies” shall mean all merchandise, supplies, inventory and other items used for the operation and maintenance of guest rooms, restaurants, lounges, swimming pools, health clubs, spas, business centers, meeting rooms and other common areas and recreational areas located within or relating to the Improvements, including, without limitation, all food and beverage (alcoholic and non-alcoholic) inventory, office supplies and stationery, advertising and promotional materials, china, glasses, silver/flatware, towels, linen and bedding (all of which shall be 2-par level for all suites or rooms in the Hotel), guest cleaning, paper and other supplies, upholstery material, carpets, rugs, furniture, engineers’ supplies, paint and painters’ supplies, employee uniforms, and all cleaning and maintenance supplies, including those used in connection with the swimming pools, indoor and/or outdoor sports facilities, health clubs, spas, fitness centers, restaurants, business centers, meeting rooms and other common areas and recreational areas. “Survey” shall have the meaning set forth in Section 4.1. “Third Party Consents” shall have the meaning set forth in Section 8.3. “Title Commitment” shall have the meaning set forth in Section 4.2. “Title Company” shall have the meaning set forth in Section 4.2. “Title Policy” shall have the meaning set forth in Section 4.2. “Title Review Period” shall have the meaning set forth in Section 4.3. “Tradenames” shall mean all telephone exchanges and numbers, trade names, trade styles, trademarks, and other identifying material, and all variations thereof, together with all related goodwill (it being understood and agreed that the name of the hotel chain to which the Hotel is affiliated by franchise, license or management agreement is a protected name or registered service mark of such hotel chain and cannot be transferred to Buyer by this Contract, provided that all such franchise, license, management and other agreements granting a right to use the name of such hotel chain or any other trademark or trade name and all waivers of any brand standard shall be assigned to Buyer. “Utility Reservations” shall mean Seller’s interest in the right to receive immediately on and after Closing and continuously consume thereafter water service, sanitary and storm sewer service, electrical service, gas service and telephone service on and for the Land and Improvements in capacities that are adequate continuously to use and operate the Improvements for the purposes for which they were intended, including, but not limited to (i) any right to the present and future use of wastewater, drainage, water and other utility facilities to the extent such use benefits the Real Property, (ii) any reservations of or commitments covering any such use in the future, and (iii) any wastewater capacity reservations relating to the Real Property. Buyer shall be responsible for any requests or documents to transfer the Utility Reservations, at Buyer’s sole cost and expense. “Warranties” shall mean all warranties, guaranties, indemnities and claims for the benefit of Seller with respect to the Hotel, the Property or any portion thereof, including, without limitation, all warranties and guaranties of the development, construction, completion, installation, equipping and furnishing of the Hotel, and all indemnities, bonds and claims of Seller related thereto. 2.1 Purchase and Sale. Seller agrees to sell and convey to Buyer or its Affiliates and/or assigns, and Buyer or its assigns agrees to purchase from Seller, the Property, in consideration of the Purchase Price and upon the terms and conditions hereof. All of the Property shall be conveyed, assigned, and transferred to Buyer at Closing, free and clear of all mortgages, liens, encumbrances, licenses, franchises (other than any hotel franchises assumed by Buyer), concession agreements, security interests, prior assignments or conveyances, conditions, restrictions, rights-of-way, easements, encroachments, claims and other matters affecting title or possession, except for the Permitted Exceptions. 2.3 Purchase Price. Buyer agrees to pay, and Seller agrees to accept, as consideration for the conveyance of the Property, subject to the adjustments provided for in this Contract, the amount of __________________ and No/100 Dollars ($______________) (the “Purchase Price”). 2.4 Allocation. Buyer and Seller shall attempt to agree, prior to the expiration of the Review Period, on an allocation of the Purchase Price among Real Property, tangible Personal Property and intangible property related to the Property. In the event Buyer and Seller do not agree, each party shall be free to allocate the Purchase Price to such items as they deem appropriate, subject to and in accordance with applicable laws; provided, however, any value affidavits required to be filed in connection with recording of the Deed (as defined below) shall contain Buyer’s allocation. 2.5 Payment. The portion of the Purchase Price, less the Earnest Money Deposit and interest earned thereon, if any, which Buyer elects to have applied against the Purchase Price (as provided below), less the Escrow Funds, shall be paid to Seller in cash, certified funds or wire transfer, at the Closing of the Property. At the Closing, the Earnest Money Deposit, together with interest earned thereon, if any, shall, at Buyer’s election, be returned to Buyer or shall be paid over to Seller by Escrow Agent to be applied to the portion of the Purchase Price on behalf of Buyer, and the Escrow Funds shall be deposited into an escrow account pursuant to the Post-Closing Agreement as contemplated by Section 8.9. (b) The Earnest Money Deposit shall be held by Escrow Agent subject to the terms and conditions of an Escrow Agreement dated as of the date of this Contract entered into by Seller, Buyer and Escrow Agent (the “Escrow Agreement”) in the form attached hereto as Exhibit G. The Earnest Money Deposit shall be held in an interest-bearing account in a federally insured bank or savings institution reasonably acceptable to Seller and Buyer, with all interest to accrue to the benefit of the party entitled to receive it and to be reportable by such party for income tax purposes.